JAMES CUBBY WRITER: Still BRRRRRRRRRRRRRRRRRRRRRRRR! It's warming up in Miami but it's still cold (50 degrees last I looked) for Miami Beach. The cold weather has kept me inside and chained to the computer. Yesterday was the first day I ventured to the gym since this cold wave hit. Any excuse to skip the gym. (Not really, I'm hooked on the gym and really have missed the classes but nothing can get me to bike in the cold.) Sorry for the weak blog but my mind is frozen. I'm waiting for the big thaw. No comments please. 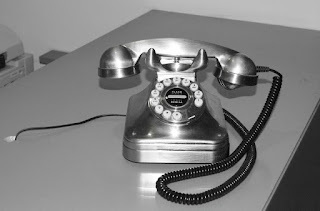 PHOTO; Isn't this a great phone? Can anyone name the South Beach hotel that has this phone on their counter?